Oven Cleaners Home & Commercial Kitchen Brent NW | Quality Property Care Ltd.
You care about the healthiness and quality of the food you and your family eat? Keep your oven or cooker is clean. The nasty burnt on grime, grease and carbon residue on your oven can be harmful to the food you cook. To make sure your oven is perfectly clean and safe, call Quality Property Care Ltd.. We offer efficient professional oven cleaning in Brent NW. Our home and office oven cleaning service is recommended and preferred by a growing number of homeowners and owners of professional kitchens. The professional oven cleaning company offers deep cleaning of all kinds of cookers, hobs, cooktops, ovens, microwaves, fridges, freezers, extractors, grills and other kitchen appliances at competitive oven cleaning prices. Call Quality Property Care Ltd. to receive your free quote within 2 hours. You can also use the online request form. Customer support is available, so go ahead! While the main focus of this service is your oven, we also have additional solutions which can be used to maintain your entire kitchen. We can clean every surface in it, starting with the tiles and grout on the walls and floors, sinks, trash cans, countertops, warm drawers, cupboards and more. Take advantage of our thorough oven cleaning service and call for our help from Monday to Sunday. We can clean double ovens, ceramic hobs, single ovens, gas cooktops, hotplates, gas hobs, stoves, ceramic cooktops, cookers, Stanley Range comers, AGA cookers, Rayburn range Cookers, cookware, extractors, oven racks, freezers, warming drawers and fridges including all detachable parts like trays, racks, panels, fans, control knobs, extractor fans and light protectors. Our trustworthy professional oven cleaning company many years of experience in the cleaning services industry. 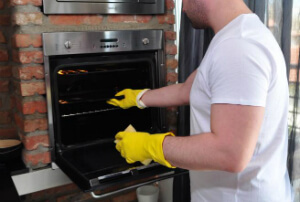 With the help of the latest cleaning techniques and detergents we have developed the right formula for faultless, eco-friendly and fast oven cleaning services in Brent NW. Upon request, Quality Property Care Ltd. technicians can also provide you with cleansing of your entire kitchen. If your kitchen needs only an oven cleaning service, we can offer you additional cleaning services for your home: window cleaning, upholstery cleaning, carpet cleaning, end of tenancy cleaning and more. Attention: customers, who order several services at once receive a special discount! Call our polite customer assistants today! Apart from the aesthetic aspect, cleansing your oven professionally will first of all lead to faster cooking, because a dirty oven takes more time to warm up. Moreover, the food will be healthier once all the toxic residues and the burnt carbon in it are removed. You will increase the life of your cooker or oven. The regular deep oven cleaning is a wise investment for both domestic and commercial customers. Book several cleaning services at once and you will get an amazing discount from Quality Property Care Ltd.! Don`t give up on healthy cooking and don't put on risk people around you! Get the oven cleaning Brent NW deal now! Call us on 020 3746 4287 and get your free estimate or ask for additional information. Keep cooking healthily with Quality Property Care Ltd. and order professional oven cleaning service today!